When two 'Lil' rappers join forces and get on the road to trek 17 cities around the nation, expect big beats, rhymes, and freestylin' jams from Lil Pump & Lil Skies. It's a back-to-back showdown of who's gonna drop the mic with the loudest, the fastest, the meanest, and the wildest flows that could either raise the roof or bring the house down. Lock it in at the Fillmore Auditorium on Wednesday 1st May 2019. Book your tickets now! 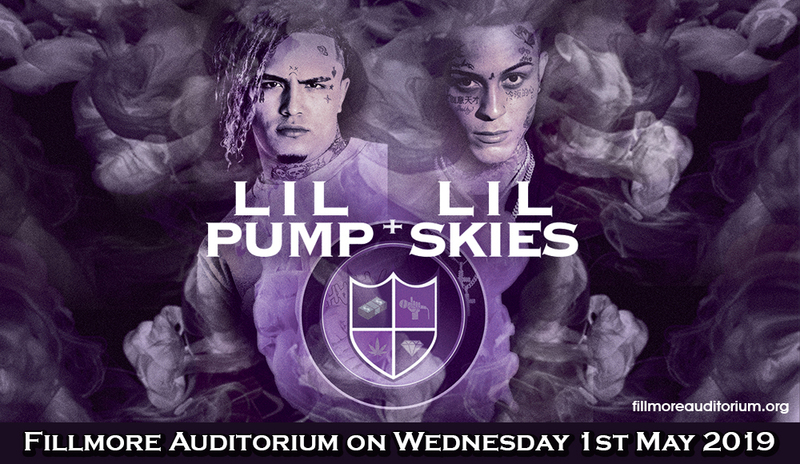 Rising star rappers Lil Pump & Lil Skies are embarking on a joint tour, that could come as support for Lil Pump's chart-topping album Harverd Dropout. Lil Pump's notoriety as a civilian is somehow lateral to the satirical messages of his songs. Lil Pump is truly a wild child with a streak of genius. Even before he hit the age of 17, his self-released singles uploaded on Soundcloud has hit over seven million streams. This caught the attention of a major record label who signed him and ushered-in the commercial single release of "Gucci Gang," which reached No. 7 on the Billboard Hot 100. The world was all ears and it hit the top of the charts worldwide. It also made heads turn, as his music also caught the attention of biggie rappers such as Florida. "Boss" "Elementary," "Drum$tick," "Ignorant," "D Rose" are just some of Lil Pump's biggest hits. His music video has fetched more than 50 million views on YouTube. As a spin-off to "Gucci Gang" as to how Lil Pump's sees campus life from his eyes, had just released his new, original YouTube series "Pump University" — which is intended to give students a "deeper look into what his version of college looks like." Lock-in this loaded concert event. Get your tickets now!